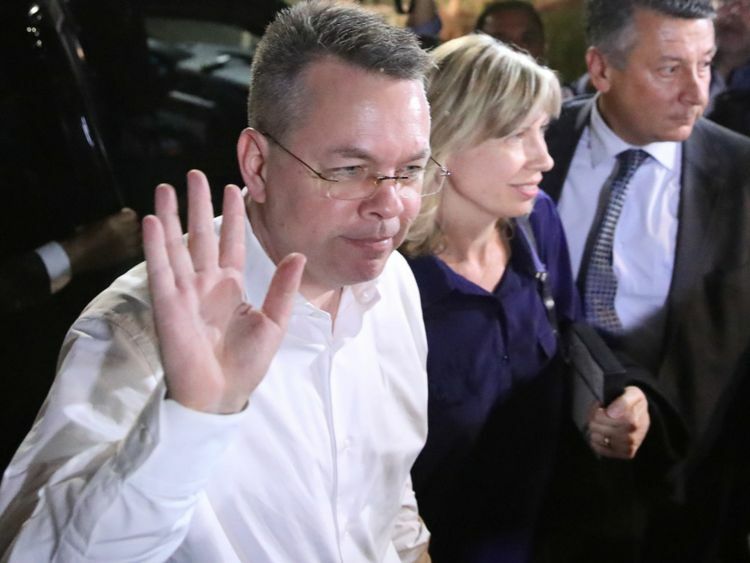 American pastor Andrew Brunson has begun his journey home after being freed from house arrest in a case that badly strained ties between the US and Turkey. As the evangelical missionary prepared to leave Turkey this evening, his parents Ron and Pam Brunson told Sky News of their relief. Their son was arrested two years ago when Turkish authorities accused him of having links with the outlawed Kurdistan Workers' Party (PKK) and the Gulenist movement. Ankara blames Gulenists for the failed 2016 coup against President Recep Tayyip Erdogan's regime. Mr Brunson has lived in Turkey with his wife and three children for more than 20 years. He spent most of that time working for the Izmir Resurrection Church, which had a small congregation. The pastor's case has led to a diplomatic dispute between Ankara and Washington, with the US imposing sanctions and trade tariffs and the threat of more. However, in recent weeks, Mr Erdogan said he hoped to rebuild relations with Washington with "the spirit of strategic partnership". On Friday, a Turkish court convicted the pastor on terror-related charges but released him from house arrest and allowed him to leave the country. He subsequently set off on his way home via a planned two-day stay in Germany, with US President Donald Trump tweeting: "PASTOR BRUNSON JUST RELEASED. WILL BE HOME SOON!" Speaking from their home in North Carolina, Mrs Brunson said: "People around the world have been praying for Andrew faithfully for two years. And we're just praising God. "We're getting messages from all over thanking God for answering prayer." Her son strongly denies any connection to the Gulenist movement and Mrs Brunson added: "He never even knew a person connected to Gulen. "He did a lot of relief and aid work with Syrians, but he did nothing against the government. He was totally supportive of the government." "The prison he was in was very different from the one that he was in first where there were just 20 people in the cell together," he said. "This last one he was just with another person but he said: 'Don't think it was easy'." The couple said Mr Trump and Vice President Mike Pence had been instrumental in securing their son's freedom. Mrs Brunson said: "The vice president contacted Norrine [Andrew's wife] and the White House has left a message on our phone. "I don't know why they would pay so much attention to one man. The government has been very supportive of the efforts to try and get Andrew out." Dressed in a black suit, white shirt and red tie, Mr Brunson, who was one of 20 Americans charged after the coup attempt two years ago, told the court on Friday he was "an innocent man". "I love Jesus. I love Turkey," he said. His parents, who were waiting to speak to him, said: "It's a tremendous relief because the situation in Turkey has not been most stable.